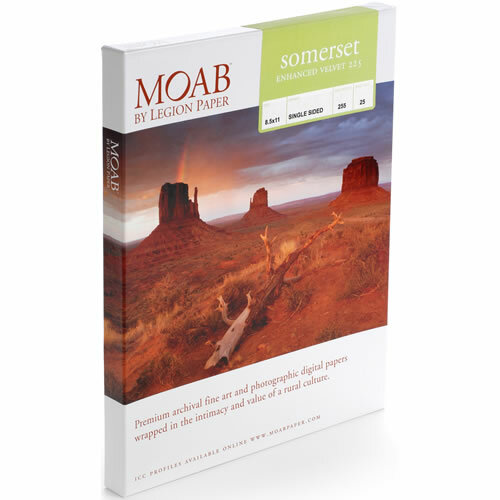 Somerset Enhanced is an exquisite inkjet paper perfect for high quality photography and fine art reproduction. The paper is available in several surfaces and has a fine art heritage capable of reproducing the natural beauty of an image, while still retaining the subtleties and elegance of an authentic artist paper. Buffered with calcium carbonate for protection from contaminants. Somerset Enhanced Velvet is a 100% cotton, mouldmade paper yielding exceptional depth of color with a true velvety fine art texture. The surface of the paper becomes an inherent part of the finished print, without overwhelming the image, but adding a fine art element to the composition.